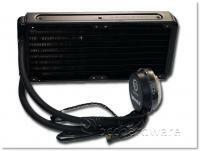 We have just taken a look at the Thermaltake Water 2.0 Extreme Liquid Cooling system. This kit has a large 120x240mm radiator, monitoring and control software as well as a lot more. If you are looking for a high performance cooling system for your toasty CPU - either this generation or last generation, this kit will perform. Take a look and see how it all shakes down in our review. Hot on the heels of our reviews of both the Thermaltake Water 2.0 Pro and Water 2.0 Performer kits, we have a look at the Big Daddy - the Water 2.0 Extreme. This kit is the beefy father - or maybe more like the hired muscle. While it has a pump that looks very similar, it comes with a USB connection and some software for monitoring fans, liquid temperatures and overall performance. This kit features a dual-radiator that is big enough to put two 120mm fans on one side and it supports all current and last-generation CPUs.